Sometimes it’s a habit that becomes a quirk, sometimes it’s gadgets. In fact, that’s the easiest way to be “different” without actually changing your “essence,” get some goofy stuff. You can now harness the power of the sun and the stones by using the Stonehenge Watch. Just position the watch using the accompanying high viscosity compass to tell local apparent time just as the builders of Stonehenge did thousands of years ago. Prove the accuracy of both The Stonehenge Watch and your mastery of its power by confirming your calculation of the time by reference to the analog watch that is set into the reverse side of the watchcase. The Stonehenge Watch allows you to predict the exact moment of the winter and summer solstices. I’m not sure you’re harnessing the power of the sun as much as you’re freaking out people around you. This is a good little object to pull out the next time someone asks you what time it is. Just start taking your reading, then tell him we’re still two moons short of the solstice. We have here the latest development in cell phone technology and it’s a big hunk of beautiful plastic. An accessory for your phone that you can really grab onto. Something with heft and that good-old-American solid construction feel – like a 1972 Cadillac. 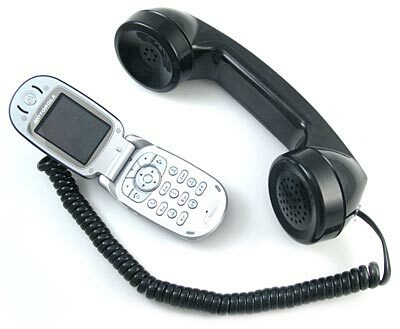 The Retro Phone Handset is a new production replica of the Western Electric 500-series model, which was the classic phone handset for several decades. It’s been slightly modified to work with the headset jack of most cell phones (or via a “hands free” adapter kit, sold elsewhere). Just plug-in and dial – or for added effect, put your cell phone in your pant’s pocket – then it looks like you’re talking on a phone connected to… well, who knows? This will also give users a chance to slam their phones against tables or people, rather than gruffly snapping them shut in disgust. One of my favorite hobbies that I don’t get to practice (I’ve lived at a dozen different addresses in the last two years and just spent ten weeks on the road living in hotel rooms) is horticulture. Plants, I love plants. If I had my college years to live over, I would have gone into horticulture, no question. There’s just something incredibly fulfilling and interesting about working with plants. Fresh from the Orient (literally! ), these living miniature bonsai plants grow in peat moss and are encased with small clear cylindrical capsule. 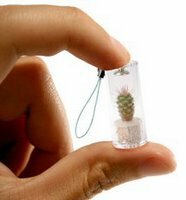 PetPlants come with a lanyard that is ideal for your mobile phone or key chain so you can carry them with you anywhere to show your friends, and are lots of fun to grow and care for. Just give them sunshine or office light, and water occasionally, and they will grow in their capsule. Treating your PetPlant with TLC (Tender Loving Care) is the main requirement! Then again, maybe I wouldn’t.